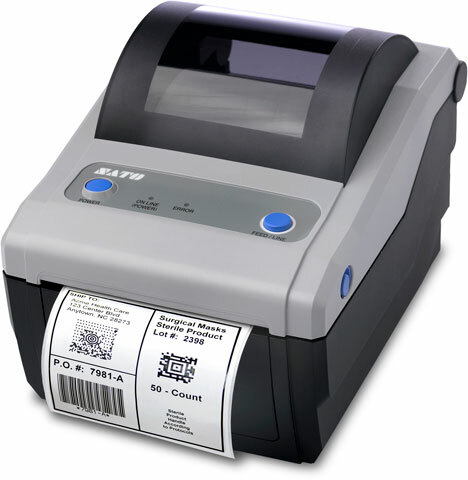 The SATO CG408 is a full-function desktop printer with a 4" print width and a 203 dpi resolution and is available in direct thermal and thermal transfer versions. The SATO CG408 is delivered stock out of the box with competitive emulations onboard, optimal interfaces (built in USB standard) and an antimicrobial casing for outstanding performance in clinical and processing environments. Desktop Printer, Print Method: Thermal transfer, 203 dpi, ZPL emulation compatible, 4.1" Print width Interface Options: Serial and USB. Love this little printer. We own about a dozen of them. Very reliable and great quality print. Will continue to buy them. Love this little printer. We own about a dozen of them now. They are very durable and cost effective. CG408 Extended Warranty without Printhead Coverage. CG408 Two year Extended Warranty with Printhead Coverage. CG408 USB+LAN Direct thermal Spare-in-the-Air Program. CG408 USB+LAN Thermal transfer Spare-in-the-Air Program. CG408 USB+Parallel Direct thermal Spare-in-the-Air Program. 3" x 1" Direct thermal paper label. 1810 labels/roll, 4 roll case. Also available as a roll (Part# 54Sx02005-R). 4.33" x 295' Black Wax-Resin Ribbon. Compatible with CodeGate4 Series Printers. 24 ribbon case. Used with polypropylene labels. Also available as a single roll (Part# 12S000320-R).